The above info came from Kristy, and was edited by yours truly (contact me). The image came from YuriChan's Anime Program Guide. Hilary didn't have a thing for spinning tops for a while in the beginning of the series. She seemed to have fun bullying Tyson. When she was kidnapped with Kenny, she realized that Tyson was actually a big help. After that she started going around with them. She couldn't see bitbeasts before she really had to. She used to get really frustrated. Tyson got really irritated and made a circle around her and told her not to go outside of it. She got all teary-eyed and ran off. It is obvious that she has a crush on Tyson toward the beginning of the second season. Tyson doesn't actually respond to her feelings until the 3rd series. She seems to be partial towards Kai too, but she doesn't act the same with Kai as she does with Tyson. When the Physic's tower collapsed, she became really worried because Tyson was still in there. 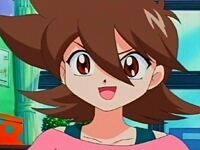 In the 3rd series, she seems to be angry at Hiro and Daichi because of the way they act towards Tyson. She pretends to hate Tyson with all her heart but she does her best to please him and usually he doesn't seem to see through her outer actions. Personally, I don't feel that the evidence provided here says much about any kind of crush. I would expect any good friend to act like how it says she acted. But then, I haven't really watched more than a few episodes of Beyblade V-Force. Others feel that she has more of a crush on Kai than on Tyson, but I'll leave that up to you to debate... and please note, this does not mean that you need to send me e-mails expressing your opinion on this matter. I already have too many emails to deal with as it is. But I'm sure the Beyblade fans in the Forum would love to hear your thoughts! The above description came from sanjana, and was edited by yours truly (contact me). Hilary goes to the same school as Tyson and Kenny. Though her first impression in the series comes across as a bit bossy, she's quite the loyal and friendly girl, and she uses her head to figure out problems to help out the Bladebreakers. Hilary is the class president and doesn't seem to care much about BeyBlades at the start of the second season. If Hilary wasn't complaining about Tyson, she'd be arguing with him. She started to hang out with Tyson when a bunch of scientists captured her and Kenny in order to blade Tyson. She wanted to find out who they were and what they wanted. Though she and Tyson tend to fight alot, she tries her best to help the Bladebreakers out. Hilary initially had no knowledge of the sport of Beyblading, and for a while was even unable to see bit beasts. Now she seems to be a full fledged member of the Blade Breakers, though Tyson would still call her the "wicked witch of the eighth grade" if he could. Oh yeah, and she couldn't see a Bit Beast until she really had to. It's quite noticeable that she has a crush on Tyson. When the Blade-Breakers get stuck on an island to battle Team Physic Tyson gets injured. When he's battling Physic's leader Hilary tries to stop him, but Kai tells her that the bond between Dragoon and Tyson is unbreakable. Hilary gets all teary eyed and says, "He never told me about that before..."
The above description came from DigiTails, Brianna Smith, and Kristy, and was edited by yours truly (contact me).